Just days before the pros arrive at Glen Abbey Golf Club to compete for the RBC Canadian Open Championship title, tournament week will be officially kicked off with the course hosting the RBC Canadian Open 5K Golf Run, returning for its second year on Saturday, July 22, 2017, giving participants the unique opportunity to combine their love for both running and golf. Running five kilometres through the historic Glen Abbey course, participants will begin near the first tee of the Championship Course, and finish alongside the iconic eighteenth green, where some of the game’s greatest players including Greg Norman, Vijay Singh, Tiger Woods and Jason Day have raised the winner’s trophy in previous Championships. Another strong field of golf stars will compete in the RBC Canadian Open this year, just days after the race, including World #1 Dustin Johnson, two-time winner Jim Furyk and two time Masters champion Bubba Watson. 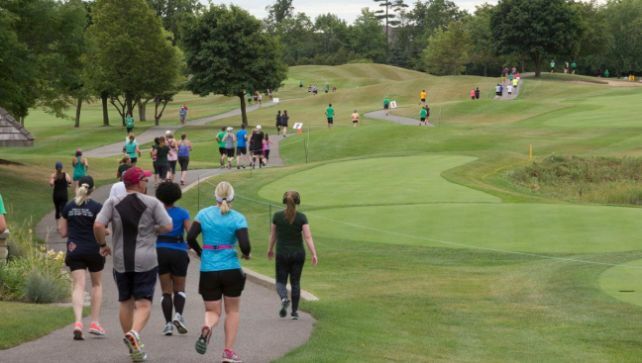 Attractive for runners and golfers alike, looking to experience Glen Abbey Golf Course on a different scale apart from golf and getting the chance to run or walk the same route as their golf idols, the golf run encompasses all traditional aspects of a race. Participants will receive an official timing chip, race t-shirt, bib and finisher’s medal, in addition to a free “any single day” ticket to the RBC Canadian Open Golf Championship. Runners and walkers will have a chance to sit back and relax post-race in the Coors Light Beer Garden while enjoying live coverage of the British Open Championship on the big screen! Also returning for 2017, The Golf Run Club Championship bids a challenge for golf clubs across Ontario to register as many of their members to participate in the run, with the winning golf club receiving upgraded tickets to the Golf Canada House Powered by Boston Pizza during tournament week. The Golf Canada House offers an enhanced experience of the tournament, with views of six different holes, and plenty of food and refreshments.